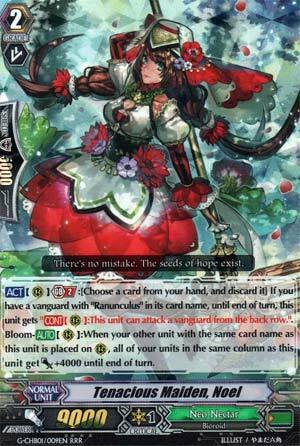 [ACT](RC) Generation Break 2:[Choose a card from your hand, and discard it] If you have a vanguard with "Ranunculus" in its card name, until end of turn, this unit gets "[CONT](RC):This unit can attack a vanguard from the back row.". Bloom-[AUTO](RC):When your other unit with the same card name as this unit is placed on (RC), all of your units in the same column as this unit get [Power]+4000 until end of turn. Next week we can move on to the next Character Booster, so let's get some of the more noteworthy cards from this one out of the way. Noel here is the card to answer Neo Nectar's players' desire to multi-attack: her GB2 lets you discard 1 card and for the turn, she can attack from the back row...if the Vanguard's a Ranunculus. She also has a Bloom ability which powers up everything in the same column as her whenever she's cloned by 4k until end of turn. In all honesty, a -1 to force more guard out of the opponent is fair enough, given the high power Bloom can give this card. I know there are people who debate between this or Sunshine Maiden Paula, and to me? This, every time. The Bloom levels of power render any more redundant, and translating that into more attacks means you get more out of it. She also eliminates the need for Stand Triggers in a pinch. The new source of aggression for Ahsha. She's worth running.